Eternity bands as a wedding ring have gained in popularity ever since their first appearance. A portrait of King George III, by Allan Ramsay (1762). 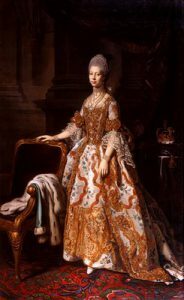 In the 18th century, new wedding ring fashions emerged. 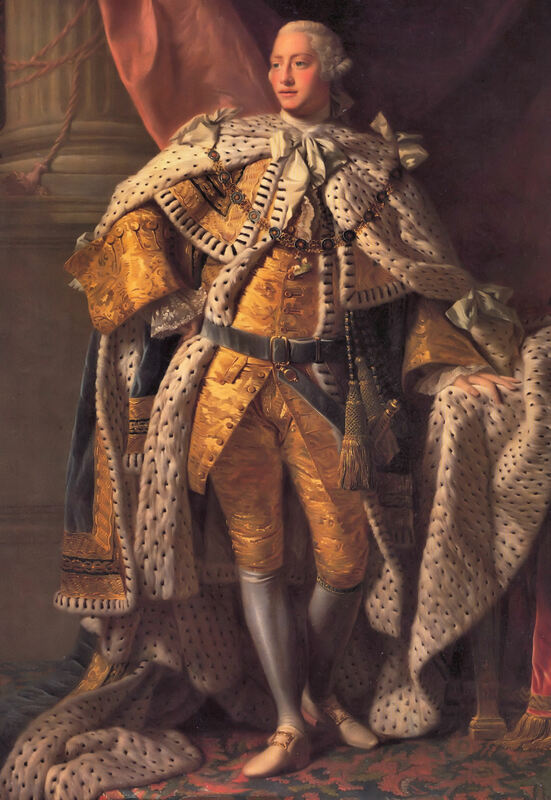 King George III introduced the tradition of the “keeper,” or guard, ring in 1761, when he presented a band encircled with diamonds to his bride, Queen Charlotte. A portrait of Queen Charlotte by Nathaniel Dance (c. 1769). The tradition of the “keeper” ring caught on with the general public because brides often considered their wedding bands so precious that a pair of rings was needed to guard or protect it on each side. 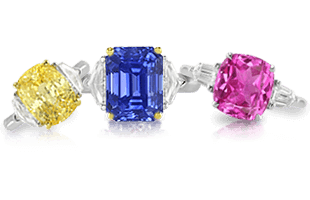 Although diamonds were often featured in keeper rings, colored stones were frequently included as well. 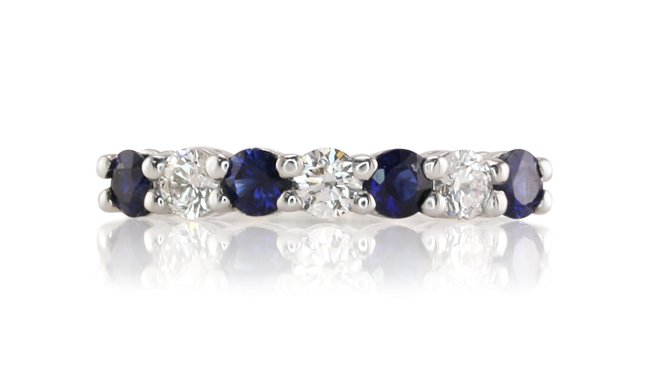 Keeper rings evolved into today’s “eternity bands;” rings of gemstones that symbolize eternal love. Eternity rings are also known as “dress” wedding rings, infinity rings, and anniversary rings. When they are not used as the wedding ring itself, they are usually gifted on significant occasions, such as a wedding anniversary or the birth of a child. A lovely diamond eternity band in rose gold. In the 1960s and 1970s, sales of diamond eternity rings increased exponentially. Large quantities of small diamonds from Siberia had just been introduced to the diamond market. In response, De Beers launched an ad campaign to stimulate demand for diamond encrusted eternity rings. 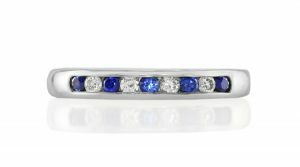 Diamond eternity rings continue to be popular today, as are eternity bands featuring colored gemstones. Eternity bands are not the only kind of anniversary ring. There is no real standard as far as anniversary rings go, and today, many couples are selecting anniversary rings that resemble engagement rings—e.g., solitaire rings with colored gemstones and/or three-stone rings (also known as trilogy rings). Because the three stones in trilogy rings represent the past, present, and future, they are used for both engagement and anniversary rings. 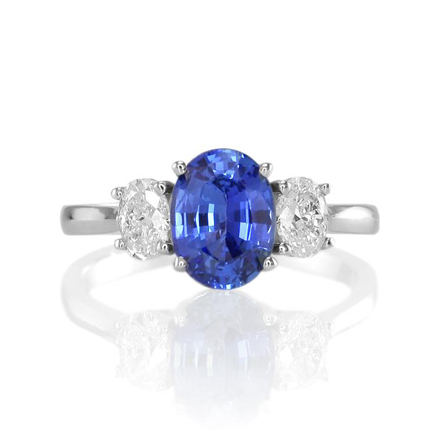 An oval blue sapphire three-stone anniversary ring. Like eternity rings, stone selection for trilogy rings is not restricted to diamonds. 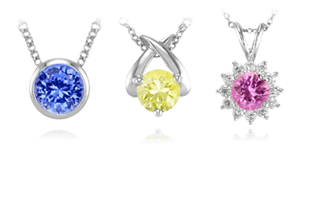 Many couples are choosing colored stones not only for their beauty, but also because they may have special significance for the wearer. Eternity bands and other types of anniversary rings–such as trilogy rings–are based on classical design principles so they never go out of style. Although the classical styling of most eternity and anniversary rings might look simple, there are several features customers should note when making their selection. Anniversary rings can be set with more than one kind of gemstone to make them more festive and personal. Diamonds are the most popular stones for eternity rings, but they are not the only option. 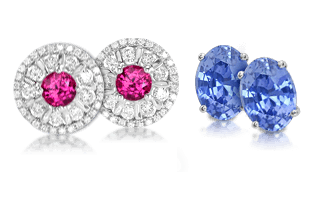 Rubies, sapphires, and emeralds are also popular, and they may be set with diamonds in alternating or repeating patterns around the ring. Couples may also opt for birthstones, anniversary stones, or other symbolic gems to make the ring more personal and significant. This design mixes two stone shapes – baguettes and rounds – to create a lovely pattern. Eternity rings usually feature compact gemstone shapes that fit closely together. 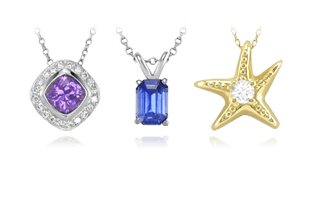 This includes round, square, emerald, or baguette-shaped stones. Eternity rings do not usually mix stone shapes or sizes, in order to preserve the continuity of the design, although alternating patterns can be found. 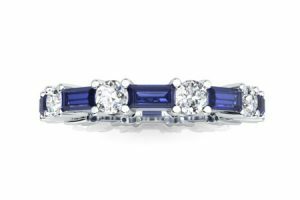 A blue sapphire princess cut channel set band. Because the designs of many eternity rings feature closely set gemstones, setting choices can be somewhat limited. Prong settings make the ring look like it is made entirely of gemstones. Channel settings are popular because they hold the gems securely. Bar settings incorporate a tiny bar of gold or platinum between each gem. 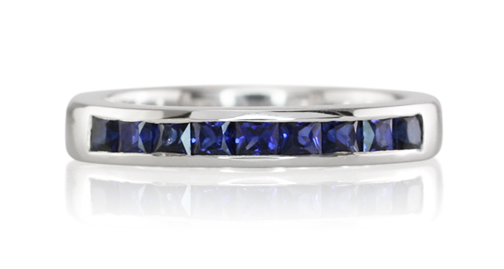 This eternity ring features gemstones on the top half of the ring. 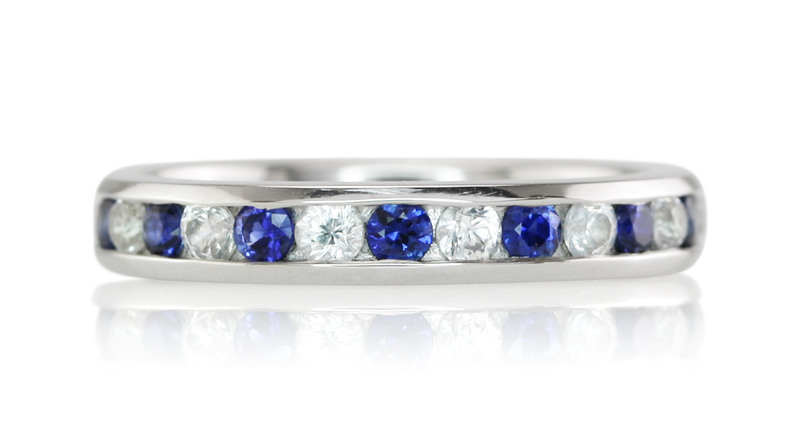 Full eternity rings have gemstones that go completely around the finger. If the ring rotates on the finger, gemstones will always be visible. 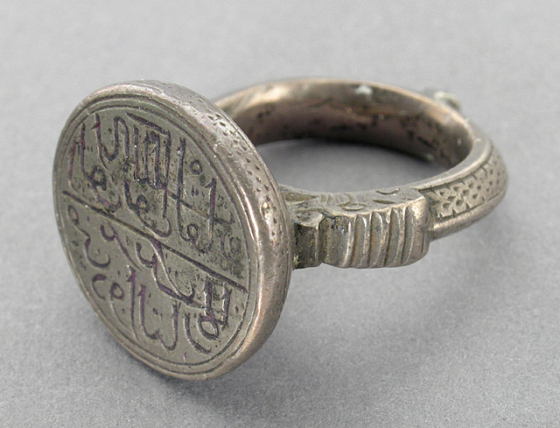 Because the stones completely encircle the finger, however, only smaller gems can be used. Half eternity rings, on the other hand, feature gemstones along the face of the band and rings may feature larger stones, but larger stones may create a ring that begins to resemble a trilogy ring. Beyond wedding and anniversary bands, Promise Rings and Friendship Rings | A Brief Overview cover more special relationships and are explored next.